This, my friends, is a flank steak. It’s one of my favorite cuts of meats for many reasons. 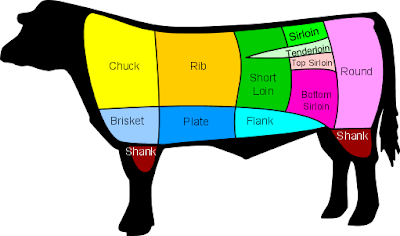 As much as I know many of us don’t like to associate our food with the actual animal they come from, this post is about education, so I will force you all to look at the official cuts-of-meat diagram! 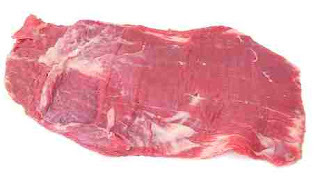 The flank steak comes from the low belly muscle of the cow. It’s long and flat, and therefore cooks up super fast. Flank steak is a lean, tender cut of beef and it is really flavorful. I usually buy mine at Costco where you get two in a pack and they’re always really nice ones. They may cost about $10 per steak, but a 1lb flank steak will feed several people, so when you break it down it’s a great deal on a good cut of meat. It’s best prepared using marinades, especially ones with acidic ingredients which will tenderize it even more. Examples include: lemon juice, wine, vinegar, pineapple, ginger, or anything tomato-based. 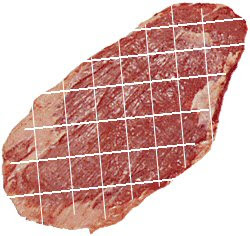 Another tenderizing method is to score the meat lightly with a sharp knife, in a diagonal pattern across the surface. (As shown below) Just barely cut into the surface, not all the way through. For best results, you’ll want to either use the grill, or place it under the broiler. If you overcook flank steak, it will become tough. So make sure it’s still pink in the middle. Slicing flank steak properly is very important. You must always cut it across the grain. You can see in the pictures how the meat has long muscle lines going in one obvious direction (the black line). To cut across the grain means to cut perpendicular to that line, as shown by the white line. If you don’t cut it the right direction, you’ll have tough, stringy meat. Slice it in ¼ to ½ inch slices. Flank steak with a great marinade will be so melt-in-your-mouth, it’s great to eat alone. However, it’s also great sliced thin to fill soft tacos, or in stir fry. wow, love the pictures! you are wayyyyyyy toooo good! wow! what cool info – I’ve always wondered about that. . . Thanks for this post! I don’t eat meat, but my kids LOVE it, so I never know the “right” way to do things. Tonight’s flank steak should be a hit thanks to you!